Label: Cash Money Records/Young Money Ent./Universal Rec. 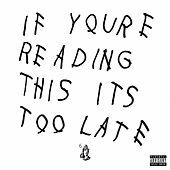 Drake has called If You're Reading This It's Too Late a "mixtape," and the hour-plus project aspires to that format's reputation for raw, unprocessed raps. He bellows on "Energy," "I've got two mortgages, 30 million in total," and refines the art of the humblebrag on "Star67" and "No Tellin'," while collaborator Noah "40" Shebib ties his strands together with their usual blend of screwed R&B anomie. The "tape" ends with "You and the 6," "Jungle," "6PM in New York" and the kind of mock-depressed musings that have defined him in spite of his frequent efforts to be the "new sh*t on steroids." 2015 Cash Money Records Inc.